The demand for pressure measuring instruments increased during the steam age. When pressure sensing technologies were first manufactured they were mechanical and used Bourdon tube gauges to move a needle and give a visual indication of pressure. Nowadays we measure pressure electronically using pressure transducers and pressure switches. Pressure can be defined as force per unit area that a fluid exerts on its surroundings. The basic physics of static Pressure (P), is calculated as force (F) divided by area (A). The Force can be generated by liquids, gases, vapours or solid bodies. Pressure transducers have a sensing element of constant area and respond to force applied to this area by fluid pressure. The force applied will deflect the diaphragm inside the pressure transducer. The deflection of the internal diaphragm is measured and converted into an electrical output. This allows the pressure to be monitored by microprocessors, programmable controllers and computers along with similar electronic instruments. Most Pressure transducers are designed to produce linear output with applied pressure. 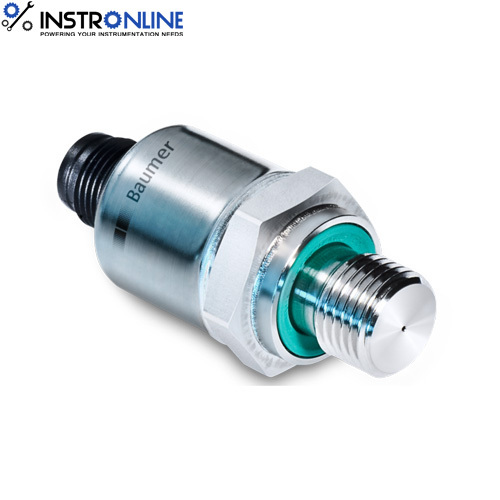 Pressure sensors are used in a range of industries, including the automotive industry, Bio medical Instrumentation, aviation and the marine industry, to name a few. We can offer Pressure Sensors in the form of pressure transducers, pressure switches, combined pressure and temperature transducers, PCB mountable pressure sensors and hazardous area pressure sensors. Our Combined Pressure and Temperature Transducers are particularly well suited for applications where space is at a premium. Our pressure transducers have a robust and modular design, stainless steel housing and a welded housing into the pressure port. They are available in miniature format starting from 12mm diameter.